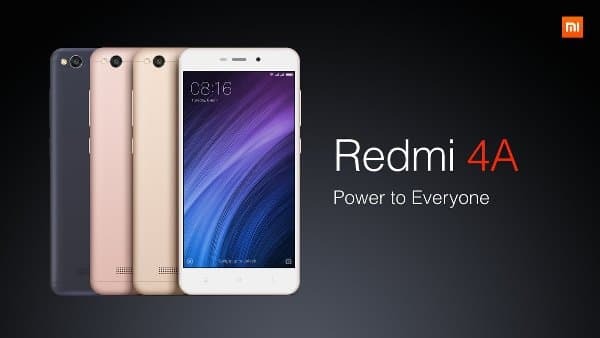 Chinese electronics conglomerate Xiaomi is all set to disrupt the entry-level smartphone in India with its new smartphone the Xiaomi Redmi 4A. We had informed you about its imminent launch about a week ago. 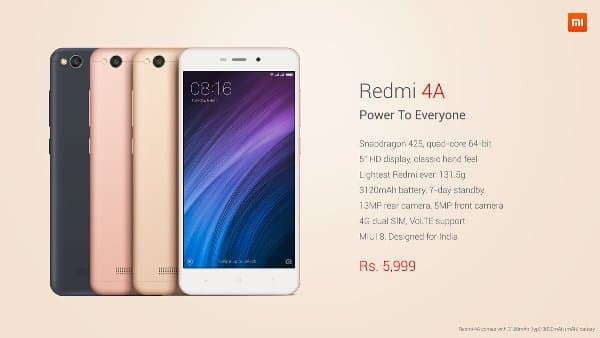 The company has launched the Xiaomi Redmi 4A to compete with low-cost Android smartphones from Indian manufacturers like Intex and Lava. The Xiaomi Redmi 4A has been carefully priced at Rs. 5,999 and will be available for sale exclusively on Amazon India and the official Mi store from March 23rd at 12 noon. The Redmi Twitter handle informs us that the Rose Gold variant of the Xiaomi Redmi 4A will be available exclusively on Mi.com. It also informs us that you can pre-order the Xiaomi Redmi 4A soon. The Xiaomi Redmi 4A manages to tick all the boxes when it comes to a good entry-level smartphone. The Xiaomi Redmi 4A has been built out of a single-piece polycarbonate body instead of metal to cut costs. It retains the good looks due to its matte finish. 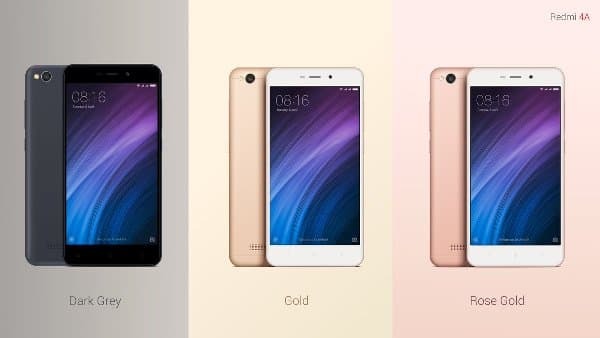 You can buy the Xiaomi Redmi 4A in Gold, Rose Gold and Dark Grey colour variants. The Xiaomi Redmi 4A has a 5inch HD (1280 x 720 pixels) resolution display which has a pixel density of 296ppi. To ease your viewing at night it comes with a blue-light filter that can be activated by choosing the reading mode in settings. Underneath the hood, the Xiaomi Redmi 4A has a Qualcomm Snapdragon 425 chipset that houses 1.4GHz quad-core processor, Adreno 308 GPU and 2GB of RAM. The Xiaomi Redmi 4A has an internal memory of 16GB and you can use a microSD card slot on the hybrid SIM slot to expand the memory in case you are not using a second SIM. The Xiaomi Redmi 4A has a 13MP camera sensor on the rear with LED flash. On the front you get a 5MP camera to handle selfies. The Xiaomi Redmi 4A is powered by a 3120mAh non-removable battery. The Xiaomi Redmi 4A supports 4G VoLTE. The Xiaomi Redmi 4A runs MIUI 8 which is based on Android Marshmallow. The Xiaomi Redmi 4A packs in Infrared, Gyroscope, Accelerometer, Proximity sensor and Ambient light sensor. The Xiaomi Redmi 4A comes with Wi-Fi, microUSB and Bluetooth connectivity. If you buy the Xiaomi Redmi 4A from Amazon then you will be eligible to get launch offers in the first flash sale. You will get original Redmi 4A cases at a discounted price of Rs. 349 and Mi Basic earphones at Rs. 599. You shall also get 28GB unlimited data along with free calls on Idea Cellular and Rs.200 promotional credit on Kindle app. Wow! This is impressive. The Rs. 6K price tag is going to find a lot of buyers. I think Samsung needs to start worrying. The phone's got VoLTE support and the rest of the specs are impressive as well. I just hope they add 32GB option. 16GB is just too little these days.